With two restaurants in Bristol (Welsh Back and Whiteladies Road), and a third on Walcot Street in Bath, Aqua Italia has become a well-known mini chain of Italian restaurants in the South West. The website claims a focus on ‘healthy, tasty and beautifully presented Italian cuisine’, with produce sourced locally. And it’s not just the cuisine that’s beautifully presented: the restaurant itself is stunning. The bar area features comfortable curved booth-style seating and a beautifully mosaic-patterned bar…the restaurant itself features lots of wood, mirrors, immaculately laid tables and modern and sophisticated lighting. It won’t be a surprise to hear that the prices match the decor: expect to be paying between £9 and £14 for a pasta dish, and between £11 and £20 for a main course…but it’s always worth checking the offers page of their website, and signing up to their mailing list for additional offers and discounts. 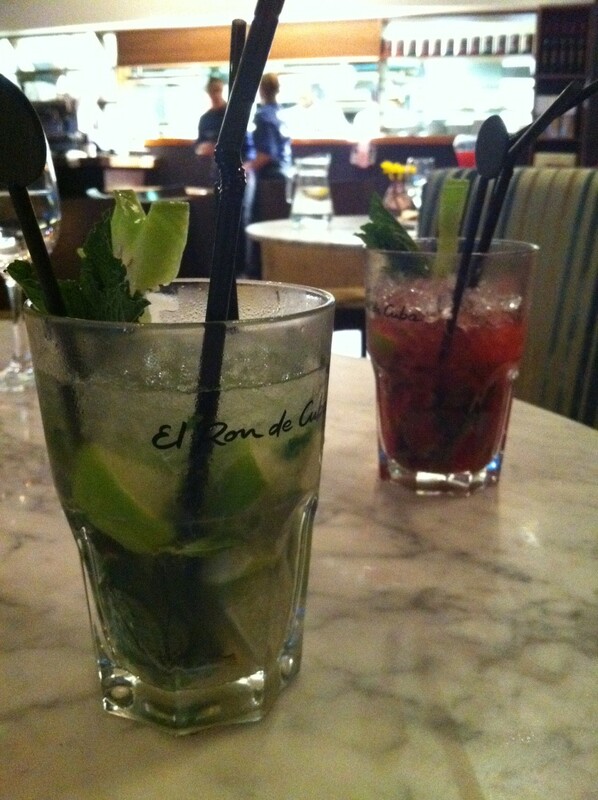 Our first task, when we arrived, was to decide on the first of the two cocktails that we were each entitled to with the voucher. Having a bit of a Ginger beer addiction, the first choice was simple and we both went for a Mint Mule: Absolut vodka, lime, mint and ginger beer served in a tall glass (normally £7.95). A twist on the classic Moscow Mule, the mint was a surprisingly good addition – and these guys are very generous with their measures of alcohol! Luckily, the basket of freshly baked breads with olive oil and balsamic vinegar (normally £3.25) that was placed on our table when we arrived helped to soak up some of the alcohol before our food arrived! The bread was delicious, but they were a little stingy with the balsamic…however, to their credit, they were more than happy to leave the bottle on the table when my dining companion asked for more. 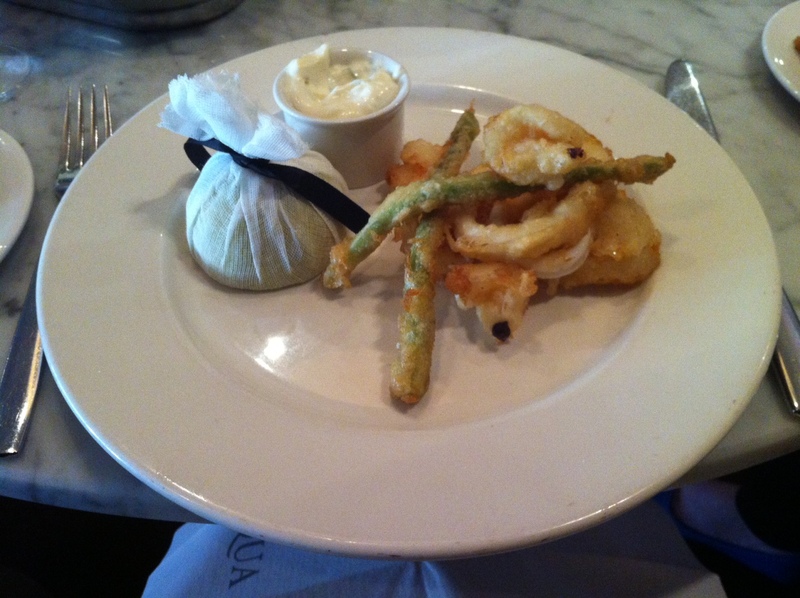 The first of our dishes to arrive at the table was our fritto misto (normally £7.25), a plate of tempura battered asparagus, king prawns and squid rings served with a wonderfully pungent garlic mayonnaise. I was glad to see that they were generous with the lemon too: half a fruit each, and thoughtfully wrapped in muslin to avoid any issues with stray pips. The tempura batter was lovely and light and didn’t overpower the flavour of the prawns or the asparagus, which still had a satisfying crunch to it. The squid, although nicely cooked, was a little light on flavour, though, and could have done with a bit more seasoning. As we tucked into our fritto misto, our two antipasti platters were brought to the table, served on one large plate that was set on a raised metal stand in the middle of the table. We got rid of this stand as soon as we could make some space – it’s a little difficult to share and eat when it’s sitting above eye level! The antipasto del salumiere (normally £8.25 for one, £17.75 to share) and the antipastro di verdure (vegetarian, £7.25/£13.75) both include delicious, moist chunks of buffalo mozzarella, marinated black and green olives and a selection of grilled vegetables, including aubergine, peppers and courgettes. 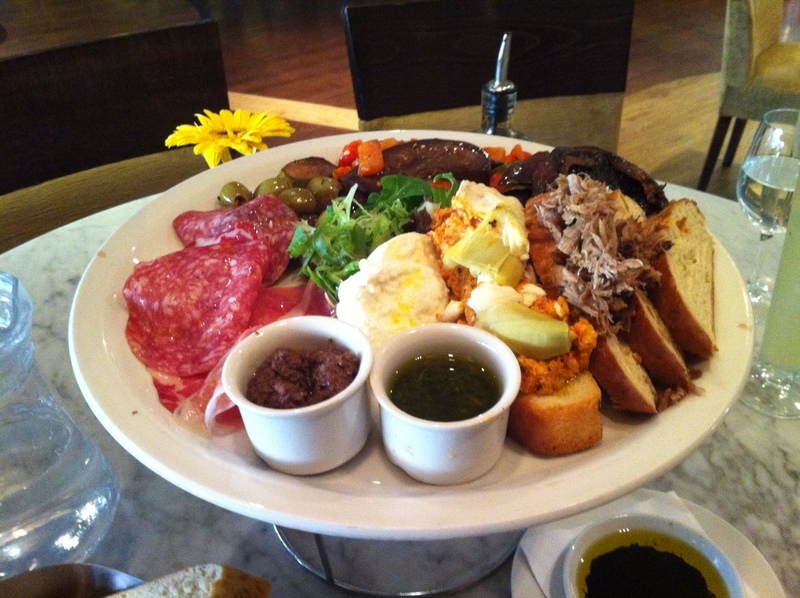 The meaty salumiere platter also provided us with slices of coppa, proscuitto and salami which were quickly devoured, a lovely salty black olive tapenade, and what was described on the menu as “roast duck ciabatta toasts” – tasty enough, but the meat was a little dry. We enjoyed the tangy red pepper and goat’s cheese bruschetta from the antipasto di verdure platter, though, and the portabella mushroom was enjoyable but unseasoned. Bizarrely, the pesto – which tasted fantastic – featured about half a pot of oil on top of the pesto itself, which was a little offputting. It’s obviously a popular venue – the place was buzzing when we were there on a Thursday night, and it was by no means purely people using vouchers. There were a lot of large groups who were obviously celebrating special occasions, and it’s just a shame that the weather was so miserable that we couldn’t enjoy the terrace. This was one of my favourite restaurants when living in Bristol, quality was always very good and agree on the atmosphere – fun and exciting without being so noisy you have to shout. I'd only ever been there for Sunday lunch before last week, which isn't really a great gauge of an Italian restaurant! Oh, and for cocktails. They do make lovely cocktails 🙂 I reckon I'd definitely go back, but it's a little pricey to eat there too often. Hello, for Web optimization genuine contents are really needed, if you only make a copy and paste then you can not ranked in search engines.